We offer more than 12 km of trails for hiking and wildlife viewing within Mitsinjo Park. The four established circuits last from 1-5 hours in length and cost between 30,000 Ariary and 65,000 Ariary per person. For the more adventurous travelers, the option to hike in remote areas of the Torotorofotsy Ramsar Site provides endless possibilities to get off the beaten path and explore less visited areas of the region. Trails in Mitsinjo Park are easy to moderate in hiking difficulty. There are several inclines on most circuits. Hiking in Torotorofotsy is more difficult as the trails are often steeper and infrastructural support less developed. You can help offset your carbon print by planting a tree and supporting our reforestation efforts. Mitsinjo has two circuits for this purpose in areas that have been reforested but need densification. Our staff will make a tour with you and give you information about climate change, reforestation and the relationship between animals and the forest. Do not miss the opportunity for a night hike in our forest. While no longer possible within the nearby national park, our community-run reserve is still open to those interested to search for mouse lemurs, listen to the frogs, or stumble across sleeping chameleons after dark. Night hikes usually begin between 18:30 and 19:00 and last around an hour and a half. You can learn about amphibian conservation efforts by taking a tour of our public terrarium and frog exhibits. These terrariums are located in our environmental education center and allow visitors to see the amphibians we maintain at our conservation breeding center, including the endangered Golden Mantella. There are four frog species on exhibit and plans to expand in the future. Orchids are the largest family of blossoming plants in Madagascar. Researchers have identified over 1200 different species. 85 % of Madagascar’s orchids exist nowhere else and many species have been classified rare. Most of them are epiphytes so their thriving depends on the conditions of their habitat. Therefore, we must protect our forests to save the orchids from disappearing. Situated next to the Mitsinjo Park, the Orchid Park comprises 11 ha of rainforest dedicated to these beautiful and magnificent flowers which amaze you with their diversity. The garden is managed by the Ministry of Environment, but Mitsinjo and Madagascar National Parks run their activities in the area. 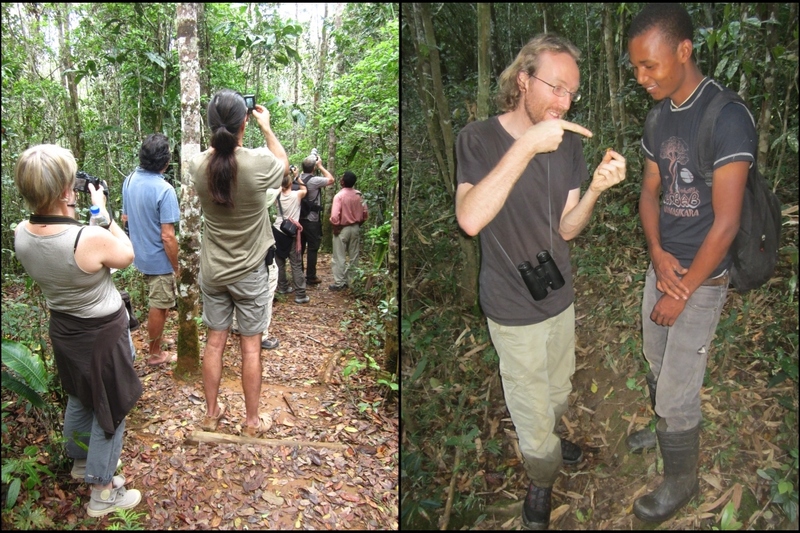 We have more than 20 experienced guides who look forward to taking you into the forest. All of our guides speak Malagasy and French and most also speak some English. Guides are mandatory in all protected areas in Madagascar, including our forests. No reservation is needed and all arrangements can be made at our office the day you arrive. If there are particular species or taxa you are especially interested in, please let us know and we will pair you with the best person for the job. Most Mitsinjo guides can also take you to Andasibe-Mantadia National Park, Vohimana Reserve, Maromizaha, or any of the other forests around Andasibe. Experience the rainforest from the top! GasiClimb operate several climbing spots within Mitsinjo Park. Their trained personnel have worked above ground in the canopy throughout Madagascar, both with tourists and researchers. In Mitsinjo’s forests you can climb a tree, sleep overnight in a hammock and zip-line down to the ground. All of this can be arranged at our office. You can also contact gasiclimb@gmail.com.